WOW! You are so much fun these days. 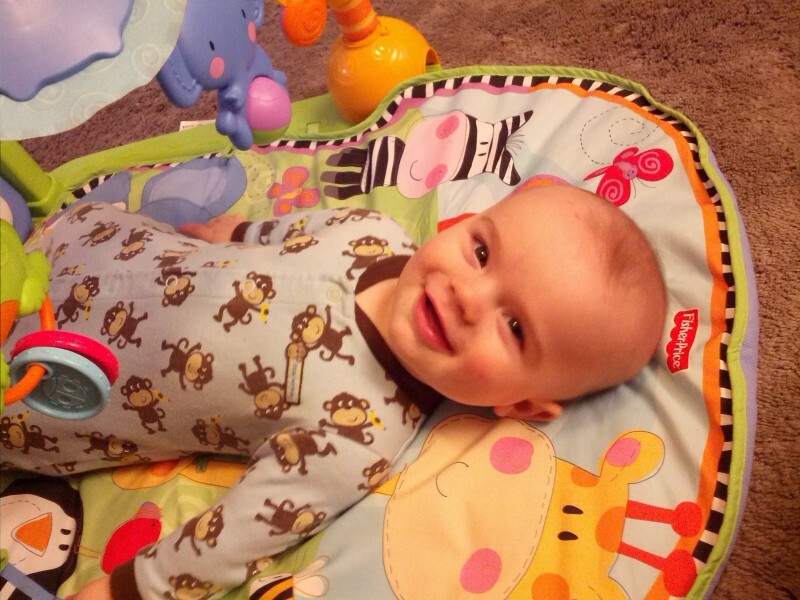 I’ve decided that everyone who thinks babies are awesome must be thinking about 6-month-olds or better, because this? It’s like you caught on to the concept of “fun” this month, actually. You still spend a lot of time figuring things out (for values of “figuring things out” equal to “figuring out how to get things into your mouth”). But you’ve learned to repeat behaviors — more and more complex behaviors — that you find amusing, or that prompt us to amuse you. Example: You’ve been fascinated with touching faces for a while and you love to hold onto our chins when we talk or chew, but now you will put your hands in our (empty) mouths and wait. When we hum and then spit your fingers out, you giggle…and then you do it again. Early in this month, you had your first cold, and although you find the snot-sucker particularly abhorrent, you were otherwise awfully cheerful about the whole thing. You coughed and sneezed and ate more frequently and your sleep was disrupted and stuff, but aside from that, you were pretty freaking delightful. I don’t mean to act like you’re never fussy, because there are some days when you simply do not want to be set down, and other days when you seem to whinge on just to hear your own voice, and some nights when you complain about going to bed. For the most part, though, especially compared with where we started, you’re a happy, slightly mischievous little guy. Yesterday, Daddy took you outside with Rodney to get some fresh air. When he “walked” you toward the dog and the dog ran away, you giggled. He did it again, and then again, and Rodney kept running away, and you kept giggling. We’re a little worried about setting an expectation around teasing the dog for your own amusement, but first, you’re only six months old, and second? Chase is one of Rodney’s favorite games, so he’s going to have to play it with you, too. Eventually. Developmentally, you are only nominally interested in gross motor control…and that mostly in your sleep. You often wake up nowhere near where I set you down; one night, you managed to get out of your sleepsack, roll over onto your belly, push up, and scream bloody murder at 9pm because “OMG, WTF IS GOING ON HOW DID I GET HERE MAKE IT STOP.” Which was really, really funny to your parents, who considered it payback for a bunch of baby monitor false alarms (you tend to roll off to the side and curl up for your deep sleeping). You spent most of your time this month vocalizing and becoming an expert with your fingers. You like to pick things up and move them around; sometimes, you try to thread your fingers with ours sometimes instead of just grabbing our thumbs and holding on for dear life. When you want something, you curl your whole body toward it and reach. If you can’t reach something with your hands, you’ll use your feet to grab it and bring it to your hands. You remain fascinated with textures, and you still love stupid mouth noises. “Boots-n-cats” will still make you grin every time, and any new percussive noise we make with our mouths instantly has your attention. Similarly, singing to you will almost always put an end to a simple fuss, at least for a while, and the kitchen has great acoustics. I hope this is something you will always love; I grew up singing and Daddy…well, the only thing he will ever insist that you do is learn to play piano. Also, I can’t wait for you to meet my beatboxer friend, buddy. He is going to BLOW YOUR TINY MIND. Your first Halloween is tomorrow, and it’s also the first Halloween in our home, the first Halloween that Daddy and I will be able to hand out candy to trick-or-treaters! For that, you’ll wear a simple skeleton romper and skull hat that I picked up at Target. (You will not be trick-or-treating this year. That would just be a too-obvious ploy by your parents to score free candy.) 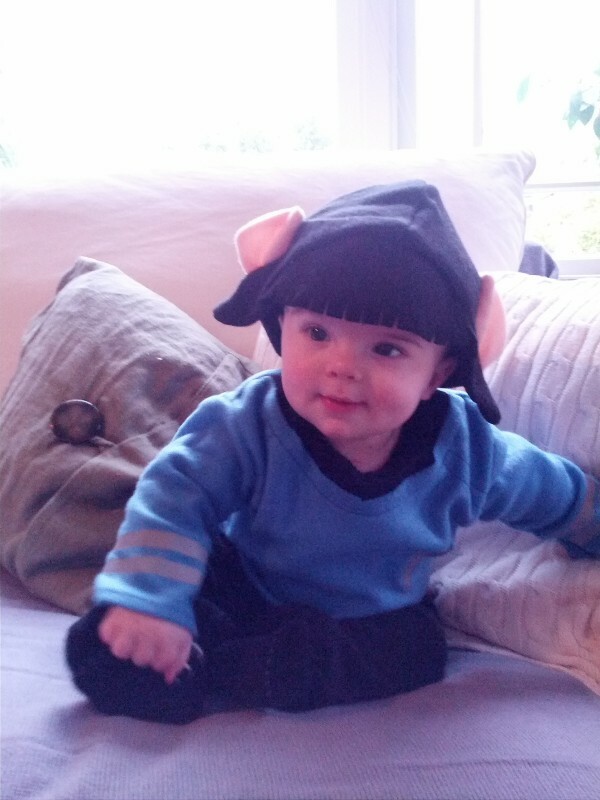 This weekend, though, we got together with our Moms’ Group for a little Halloween gathering, and for that you had a fancier costume, courtesy of Uncle D and Auntie E.
I’m kind of sorry about the cap, kiddo. Not that sorry, though, because I really love this picture. We’re grateful to D and E for not red-shirting you, and we hope that being a Lt. Commander at six months won’t screw with your expectations overmuch. Something has shifted this month, buddy. I think of it as…the texture of time. We have less of it together, what with my work schedule and your new — and AWESOME — sleep schedule, and sometimes it feels a little like we’re getting to know each other all over again. There was a time when all you did was stare at my face while you ate; now, when you do the same thing, I swear it feels like you see something different, or you’re looking for something. But then, you’ve also gotten much, much more expressive. During those few precious moments in the glider, between exploring the sound of your nails on the upholstery and the feel of the wood on your gums, you stop, look at me, close your eyes a little, and lean your little face into mine. Sometimes, your mouth is open to give me a kiss. In this almost intentionally gentle gesture, you remind me every day that I’m a mommy, that I’m your mommy, and that we’ll be just fine.